In the early twentieth century the relevance of chirality to the pharmaceutical industry was established by the fact that one enantiomer of hyoscyamine possessed greater pharmacological activity than the other. Today, most new drugs and those under development consist of a single optically active isomer, and chirality is also becoming an issue for the agrochemical and other industries. Regulatory agencies throughout the world are currently reviewing the importance of chirality with regard to pharmaceutical and agrochemical products. New guidelines from such agencies have been key drivers for the focus on single enantiomer products in these industries. These scientific and regulatory developments have created the need for a guide for workers in the pharmaceutical and chemical industries seeking information on chiral molecules, processes, and commercially available chiral chemicals. Chiral Drugs is a comprehensive listing of over 2500 chiral drugs, classified by therapeutic class, and including structures and physical properties for each entry in the listing. Its companion volume, Chiral Intermediates, presents the same detailed information for over 4700 commercially available chiral chemicals. The 'Chiral Pool' of readily available, relatively inexpensive chiral compounds has been expanding at a rapid rate as more and more products are produced in large quantities at economical prices. New developments in various technologies for isolating, preparing, and purifying chiral materials have greatly increased the opportunities for utilizing optically pure compounds in commercial applications. Novel techniques for classical resolution, new methodologies for developing selective enzymes for biocatalysis, advances in the application of microorganisms for chemical production, and continued progress in the area of asymmetric synthesis have all contributed to the growth of this field. Part One of each book contains four chapters which provide an introduction to topics relevant to the field of chiral chemistry and includes a brief overview of chirality, a short discussion on the current market drivers in the area of chiral chemistry, and a basic presentation of the various sources and methods for obtaining chiral compounds. Part Two presents entries for over 2500 chiral drugs, classified by therapeutic class. For each main entry, the chemical name and a list of trade names and synonyms is provided; the CAS Registry Number, the European Inventory of Existing Commercial Chemical Substances (EINECS) number, and the Merck Index (12th edition) number are given when available. The physical properties, including specific rotation, of each compound are described and indicated applications are presented. The structure of nearly every compound is provided, and the manufacturers and suppliers of the compounds are also given. Indexes, including a master index of names and synonyms and an index of custom manufacturing services for production of chiral compounds, are appended. 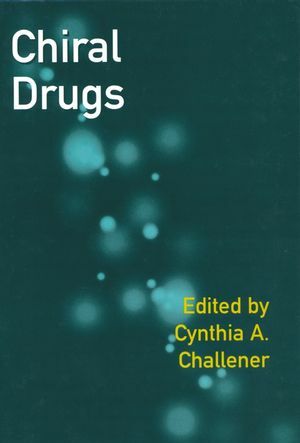 Chiral Drugs provides an introduction to the types of sources and methods currently in use for obtaining chiral molecules and is an invaluable resource for researchers in the pharmaceutical and biotechnology sectors as well as to those working in the basic biochemical sciences. Chiral Intermediates provides an introduction to the types of sources and methods currently in use for obtaining chiral molecules and is an invaluable resource for information on available chiral molecules. Chiral Intermediates and Chiral Drugs are the most comprehensive and detailed guides to chiral compounds available. Cynthia A Challener currently works as a freelance writer and information management consultant to the chemical industry. She has had experience in research and development, technical support, regulatory compliance, marketing and document and information management. Cynthia received her BS in Chemistry in 1986 from Stanford University and her PhD in Organic Chemistry in 1990 from the University of Chicago. Chapter 1: Overview of Chirality. Chapter 2: Drivers for the Chiral Market. Chapter 3: Sources of Chiral Compounds. Chapter 4: Methodologies for Obtaining Chiral Compounds: Some Examples. Part IV: Manufacturer and Supplier Directory.